One hundred and ninety-eight pilot whales have been stranded on a 6-kilometer beach in New Zealand, and their only hope is a rescue effort with the rising tide, local conservation officials reported. 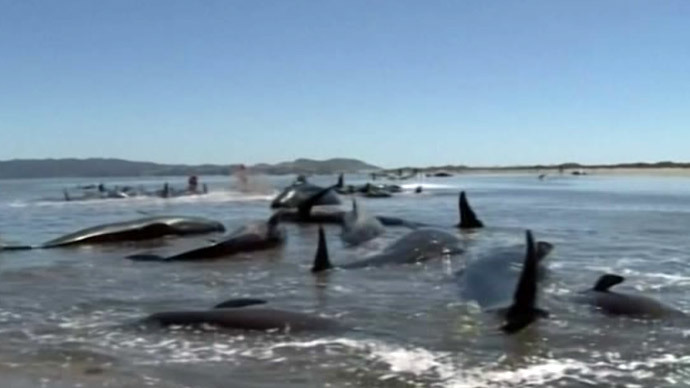 Farewell Spit of the Golden Bay, on New Zealand’s South Island, is a renowned trap for marine mammals, with at least eight strandings in the past decade, and over 50 whales found there near their death bed on Friday, while nearly 200 got trapped in shallow water, Radio New Zealand reported. The help from general public could be needed Saturday, to help keep the whales cool and wet while waiting for the next tide to ease the rescue efforts by the team of staff and volunteers. “They're in reasonable condition most of them, their skin is looking pretty good, and there's not that many have died, relatively,” DoC spokesperson Mike Ogle said, as cited by local media. Pilot whales, the most common species of whale in New Zealand waters, though inhabiting oceans almost worldwide, reach up to six meters in length. They are highly social creatures, and are also among the most frequently found stranded in groups. Several hypotheses exist to explain such stranding in groups. Some scientists dwell on geomagnetic anomalies leading to navigation faults, while others believe that the whales may follow sick or young members of the group.